Driven by demand from the entertainment industry for better and more realistic animation, technology continues to evolve and improve. The algorithms and techniques behind this technology are the foundation of this comprehensive book, which is written to teach you the fundamentals of animation programming. 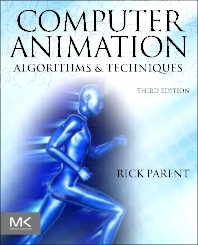 In this third edition, the most current techniques are covered along with the theory and high-level computation that have earned the book a reputation as the best technically-oriented animation resource. Key topics such as fluids, hair, and crowd animation have been expanded, and extensive new coverage of clothes and cloth has been added. New material on simulation provides a more diverse look at this important area and more example animations and chapter projects and exercises are included. Additionally, spline coverage has been expanded and new video compression and formats (e.g., iTunes) are covered. Rick Parent is an Associate Professor at Ohio State University, where he teaches computer graphics and computer animation. His research in computer animation focuses on its relation to modeling and animating the human figure, with special emphasis on geometric modeling and implicit surfaces. Rick earned a Ph.D. in computer science from Ohio State University and a Bachelor's degree in computer science from the University of Dayton. In 1977, he was awarded "Outstanding Ph.D. Thesis Award" (one of four given nationally) by the NCC. He has served on numerous SIGGRAPH committees, in addition to the Computer Graphics International 2000 Program Committee and the Computer Animation '99 Program Committee and is on the editorial board of the Visual Computer Journal. is a Professor of Computer Science and Engineering at Ohio State University, where he teaches computer graphics and computer animation. He has taught Computer Animation for over 25 years and has worked in the field for over 35. His research interests include the modeling and animating of the human figure.